Teaches children a number of foundational writing, grammar, spelling, and punctuation skills. Helps them pay attention to detail. Introduces them to passages of quality literature. OK, so are you ready for a super-fun copywork activity for the junior chefs in your family? Your children won’t be delving into literature, but this little exercise does help fulfill the first three points above. When I was eleven, I started my own recipe collection in my seventh-grade home economics class—pancakes, Dutchess Spice Cake, and caramel toast were three of my first cards—and I’ve been collecting recipes ever since! Buy them a set of cute recipe cards, or print some out on card stock. There are tons of free printables available in patterns to suit both boys and girls. Sit them down with your own recipes and cookbooks, using sticky notes to mark your children’s personal favorites as well as special family recipes. Make sure to include several simple recipes they can prepare themselves. Provide pens or pencils and let the copying begin. Younger, slower, or reluctant writers should have a time limit—perhaps five to ten minutes, depending on the child, but in general, keep this exercise to 20 minutes or less. Motivated writers will have so much fun that they may use this “writing” time as an excuse to avoid other schoolwork, so they’ll benefit from a timer as well. As your children’s assortment of recipe cards grows, reward them with recipe dividers and a personalized file box to hold their collection. They’ll treasure it someday, just as I treasure mine! You are so creative to find ways to work in writing! Oooooh! I SO love this idea…. So wise as well. By the time they leave home (hopefully married and all) they would have their own recipes (memory from their youth). Question: Where did you got the wooden boxes in the picture? They are so beautiful. JoJo: Thank you! I think most parents appreciate any opportunity to make writing both fun and practical. Isabelle: Sadly, I didn’t take this photo (I use outside sources for most of my blog images). 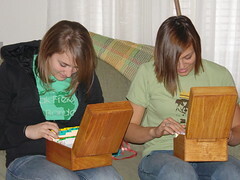 But the original photo said “handcrafted boxes,” so I assume that perhaps the girls’ dad or grandpa made them as a Christmas present. I have been following your blog and I LOVE it! You have many wonderful ideas and great links! I have enjoyed the copywork section. My son struggles with writing and it’s good to know that it’s OK to have him copy writings. He really needs that I think. It was just good to have direction in this struggle he and I face. Thank you, Emily. I always appreciate the kind comments people leave here. I love coming alongside families in their homeschooling journeys—after all, writing can be so overwhelming to teach. I just added to favorites this site. Good read. @Recipe Cards: Thanks for stopping by and “fave-ing” us. Your site looks fun!